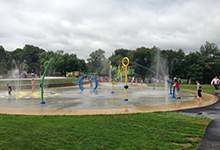 The City of St. John's operate popular splash pads at both Bowring Park and Bannerman Park. At each location the splash pads are adjacent to the outdoor swimming pools. Our splash pads are zero-depth accessible play areas and are open areas where free aquatic play is available all summer long. Hours of operation at each splash pad are from 9 a.m. to dusk every day during the summer. The last day of operation this year is Labour Day on Monday, Sept. 3, 2018. We practice water conservation at our splash pads and they both use recirculated and retreated water. To ensure wise water use and that we aren't unnecessarily treating water that no one has been playing in, the water features at our splash pads are set on a four-minute timer: they run for four minutes and then the water shuts off until you push the button to get the water flowing again. The outdoor swimming pools at both Bowring Park and Bannerman Park are open until Sunday, August 26, 2018. There is no cost to swim at these outdoor pools and the schedules for each can be found on our website.